Summary: The church is one of the most renowned ones in the region, due also to its central position in the valley of Iza, at a crossroads. Unlike most other churches, which stand on hilltops, the church of St. Nicholas is in the middle of the village, in a centre of a flat cemetery yard. The Church of St. Nicholas seen from northwest. 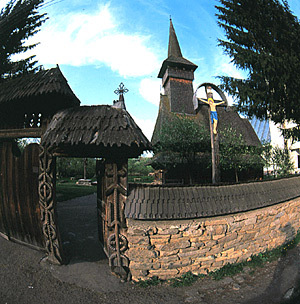 The original name of the village was Cuhea, in 1970 it was changed to Bogdan Vodă, meaning Lord Bogdan, to commemorate and honour Prince Bogdan. He ruled the surrounding kneazate from Cuhea, crossed the Carpathian Mountains in the mid-14th century and became the founder of the mediaeval state of Moldavia. Archaeological excavations have brought to light the remains of a stone church, dated to 1330-1340, which was ruined already during the 16th century. Some valuable items worth citing in the church of Bogdan Vodă are a wooden carved chandelier dated to the 18th century, a nicely carved episcopal chair also from the 18th century, and a collection of rare books dated to the 18th and 19th centuries. 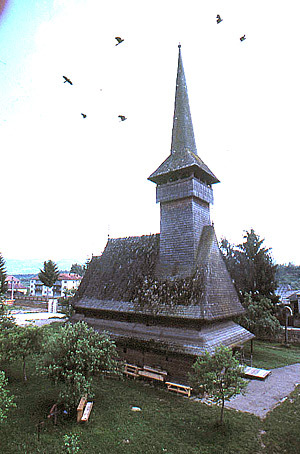 The wooden church of St. Nicholas is not very big, only 18 m long, with a tower that reaches up to 25 m, without the next-door stone church it would look quite monumental. The main body of the church, where the pronaos and naos are, is rectangular, while the chancel apse is polygonal. The roof has a double set of eaves all around the church, the chancel included. The main roof covers the pronaos and the naos, but the chancel roof is slightly lower, creating a sense of movement and freedom to the lines of the building. The square tower is above the entrance door to the pronaos. It is topped with a sharply conical roof, which is even taller than the tower itself. The Church of St. Nicholas seen from southwest. The church is built on a low foundation of square blocks of stone. The squared logs of the walls are joined neatly at the corners. The exterior is rather unadorned, the only exceptions being the wide zigzagged consoles that support the lower eave, and the carved twisted rope that goes all around the church at the height of about two metres. This decoration is considered to symbolize the limit between earth and heaven. Following a much more recent custom, which is not based on tradition, icons have been placed on all exterior walls. For such a small church, St. Nicholas of Bogdan Vodă has quite many windows. The pronaos has only one small window on each side, while the naos has three bigger windows on both walls at ground level, and another three windows on each side further up, between the two eaves. Even though the upper windows are very small, they light up the ample barrel vault of the naos. The chancel gets light through three windows. A view of the naos. On the left is the iconostasis that protects the chancel from laymen’s eyes. There are two types of paintings inside the church of St. Nicholas. 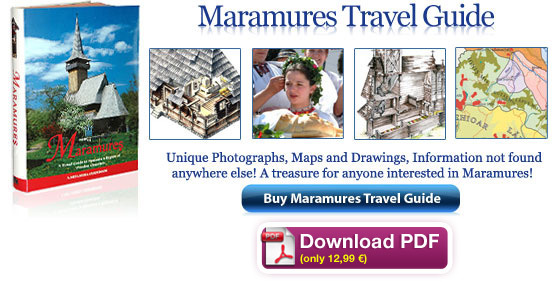 The older ones are almost like miniatures, religious scenes separated by narrow red bands. The scenes are marked with Slavonic inscriptions. The later paintings are made in the late baroque style, with freely moving characters placed in perspective against backgrounds of architecture and landscape. Red and green are prevalent colours, together with white and blue, while yellow is quite rare. 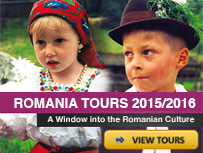 These scenes are inscribed in Romanian, but with Cyrillic letters. The original paintings with inscriptions in Slavonic were applied on top of pieces of textile that were prepared with a layer of limewash. 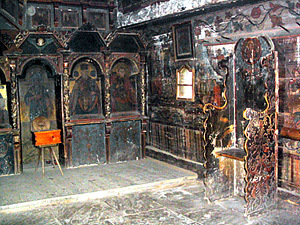 The later paintings, with inscriptions in Romanian, were painted directly on the wooden beams, which were also covered with a preparatory layer of limewash. 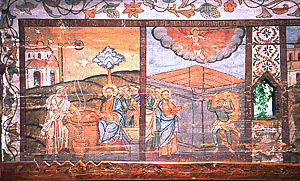 Two scenes on the south wall of the pronaos, Jesus and the Samaritan Woman, and The Parable of the Rich Fool. The interior walls were painted in 1754 at the request of the founder Pan Vasili Samplonţai of Săpânţa. There is an inscription on the frame of his portrait, which says: “For the forgiveness of his sins and for his deceased parents – in the year 1754 – the noble pan Vasili Samplonţai with his wife Ioana and his seven children”. It is extremely rare to find the portrait of a church founder in a Maramureşean church, while in many other parts of Romania it was the norm already around 1600. Much earlier, as in the 15th and 16th century Painted Churches of Bucovina, the habit had been to paint the ruling prince as the donor of the church, and not necessarily the founder himself. I came across this site while doing some research looking into my family geneology..my maiden name is Voda but,now since I am married it has of course changed.I did find this site interesting..
Este una dintre cele mai frumoase zone ale Romaniei.